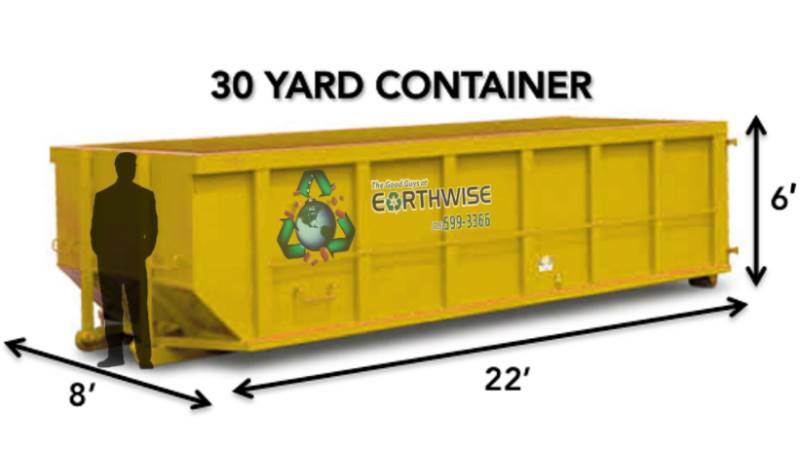 The Good Guys at Earthwise offers roll off dumpster rentals in Colorado Springs for residential and commercial customers. Our roll off dumpsters are available in a variety of sizes so that you can have the right size for your project. Whether it’s a one-time need or for ongoing service, let us make sure that your debris is the last thing on your mind. Not sure what size you need? Give us a call at (719) 599-3366 and tell us about your planned job. We're happy to provide advice. 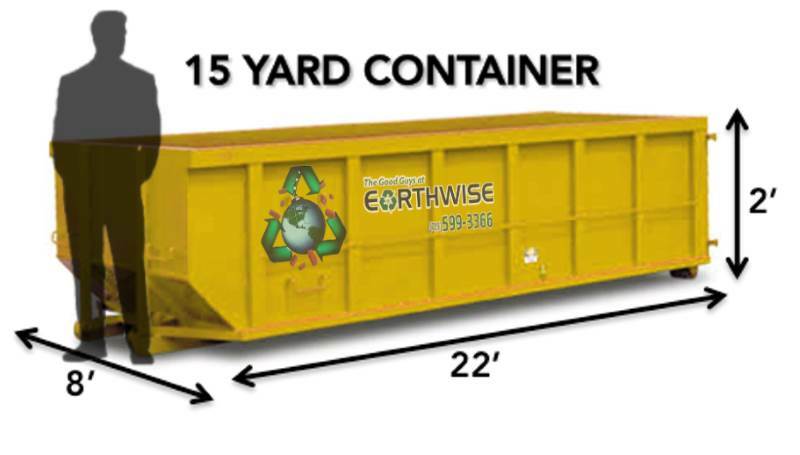 Our 15-cubic-yard roll off dumpster rental is designed for heavy duty materials only, like concrete and asphat. Its low height ensures that you won’t go over the weight limit (6 tons), even when you’re working with heavy-duty materials. Our 30-cubic-yard rol off dumpser rental is fit to handle a variety of materials. This is your best bet if you’re working on a one-time project and space is limited. The best deal for the average project. You can't go wrong with our 'Go to 30' medium size roll off. The "Big 40" is our largest roll off dumpster rental holding up to 12 or 14 pick-up trucks worth of material at a time. Better to be safe than sorry, our 40-yard dumpster can handle just about any junk you can dream up, no matter how big or bulky it may be. Have a big clean up to take care of? Maybe you're doing a remodel and are going to be tearing out cabinets and walls. 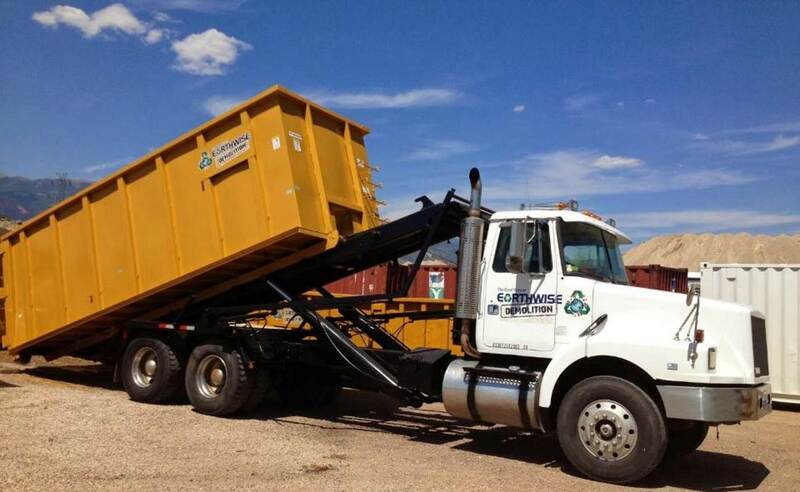 As a homeowner, you won't find an easier dumpster rental company in Colorado Springs. When you take part in our one-time roll off dumpster rental, we’ll bring one of our state-of-the-art dumpsters straight to your home. You can can fill it up at your convenience and—whenever you’re ready—we’ll come haul it away. We also offer ongoing, roll off dumpster rentals for your next big construction project. We frequently work with contractors and construction companies and know exactly what you need and how to make things as easy as possible for you. You can reserve the dumpster for as long as you need and we’ll take care of the rest. How much does a roll off dumpster rental cost? The cost of our roll off dumpster rentals in Colorado Springs and the surrounding areas is calculated based on your location and the length of time you will need the dumpster rental. Give us a call today at (719) 599-3366 and we can provide you with a quote! What payments do you accept for dumpster rentals? The Good Guys at Earthwise accepts cash, credit/debit cards, and checks. Just about anything! Our roll off dumpster rentals are great for getting rid of a large amount of unneeded items, materials removed during a remodel, or for any other time you have a large amount of materials you need removed. However, there are some hazardous materials that are prohibited due to local, state, and federal regulations. Concrete/asphalt/rock/dirt/sod must be kept separate from each other and must not be mixed with other trash. These items are very heavy and can easily reach the weight limit. They are also recyclable and are disposed of in different places than other trash items. Where can I park a dumpster? We’ve got incredibly skilled delivery truck drivers who will be able to place your roll off dumpster rental almost anywhere you need it placed. If you want it placed on a driveway, we recommend putting plywood down first in order to protect the surface. Not sure what the best place is to put your roll off dumpster rental? Just give us a call at (719) 599-3366 and we can advise you based on your situation.